Outasite, dude! 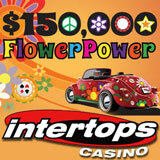 Let's take a far-out trip back to the mind-blowing ‘70s for Intertops Casino's $150,000 Flower Power Casino Bonus Giveaway. Every week 250 players will make some serious bread in the $30,000 Leaderboard Contest. At the end of the trip a $1000 Total Bliss cash prize will be awarded to one of the weekly top 15 players. Every Thursday, Peace & Love draws will give you another chance to win free casino bonuses. At Intertops you'll earn points just by playing any of the hundreds of games from Realtime Gaming that they offer. Every Monday until June 2nd the player that earned the most points the previous week gets an $800 bonus. $700 goes to the second player, $600 to the third and the next seven players each get $500. Every week 250 players get a total of $30,000 in bonuses. You could be one of them! Check your rank on the $150,000 Flower Power Scoreboard any time at http://casinopromotions.intertops.eu/flowerpower where contest details are also available.